Ever been tempted to stretch a flight, or take off a little tight on fuel? 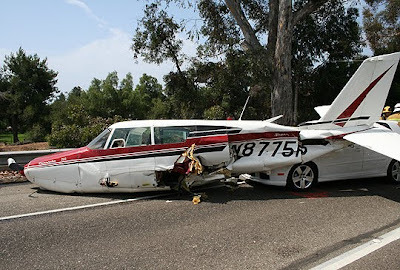 It seems that the pilot of this Piper Comanche pushed it a little too far and ran out. The pilot reportedly told Santa Barbara controllers that he was 'out of fuel' before gliding to a landing on Highway 101 in California. Apparently he intended to land with the traffic in the northbound lane, but ended up landing into oncoming traffic. The aeroplane hit two cars before spinning around and hitting a third. Luckily for everyone involved no-one was seriously injured. The only passenger was the pilot's wife (also uninjured) and I can only imagine what she said (and probably continues to say). I've occasionally taken off from the strip to pick up fuel with less avgas on-board than I would like (and I like to land with one hour of fuel left in the tanks). My limit for a 'reduced' fuel margin means landing with thirty minutes in the tanks, but with this incident sparking a re-think, I'm now in the market for a couple of 20l jerrycans that'll take me back to the general rule of one hour's worth of fuel in the tanks on landing. I've done a fair bit of flying in Southern California, and when using some airports, particularly in LA, there's pretty much nowhere else to land. Head towards Palm Springs from say Torrance and you are over dense housing for half an hour in some aeroplanes. This pilot could have helped himself by having enough fuel in the tanks to keep the engine running though.